Looking to improve the performance of a robot designed to emulate a crawling bug, engineers studying biomimicry at UC Berkeley added wings pilfered from a store-bought toy onto a six-legged, 4-inch-long running robot. 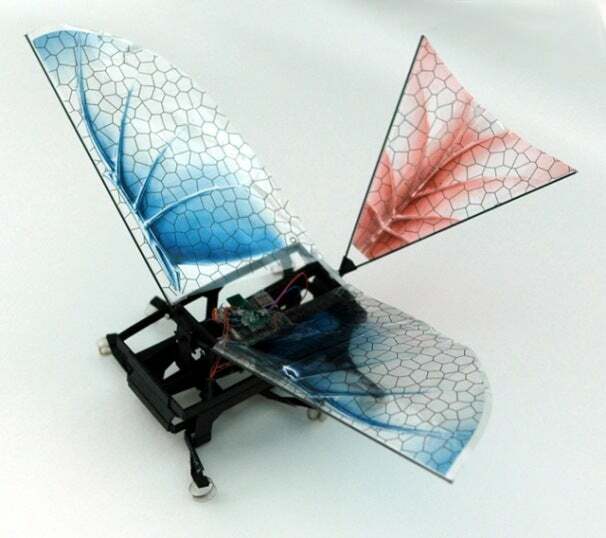 The original design, dubbed DASH (for Dynamic Autonomous Sprawled Hexapod), was outfitted with wings and renamed DASH+Wings, and used to explore how flapping wings would affect a bug that primarily walks or runs on the surface. The goal of this project was to help a running or walking robot navigate obstacles, since many robots designed to emulate bug behavior are unstable and have trouble staying upright while climbing down from heights. Perhaps a “running-and-flying” robot would be able to maneuver better than a flightless version. While adding wings was not enough to get the tiny bug-bot to take off on its own from the ground, it allowed DASH+Wings to not only run twice as fast and climb slopes three times steeper than it could before, but also to glide further, according to the research team composed of Dr. Ron Fearing and his graduate students. The engineering team behind DASH+Wings combined forces with Dr. Robert Dudley, a professor of integrative biology and an animal flight expert at UC Berkeley. Many theories on how animals developed flying abilities have been frustrated by incomplete fossil evidence, so having a wing-equipped robot capable of gliding helps researchers understand how critters first began to fly. DASH+Wings shows that robots can help confirm computer models and other theories of how animals first began gliding out of trees rather than taking off under their own power. DASH+Wings joins a host of other running and flapping robots developed in UC Berkeley's Biomimetic Millisystems Laboratory, including what’s being called Octoroach, an eight-legged, hand-sized crawling robot that has a range of about 100 meters, and BOLT (Bipedal Ornithopter for Locomotion Transitioning), a two-legged, wing-enhanced running robot that weighs half an ounce and can take off in less than a yard. What’s your favorite robot that mimics an animal or human action? What sort of applications do you think DASH+Wings would have in the field? Let us know in the comments!